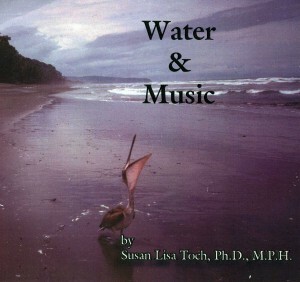 "Water and Music" plays a part in our "Power of Spirit: Sustaining Watersheds through Music, Art and Stories" initiative. It demonstrates a collaborative effort between the Science and the Arts, representing communities working together towards a common solution. It was recently presented at the UNESCO sponsored "Music as a Catalyst for Environmental Awareness" Forum, Geneva, Switzerland, 2009. 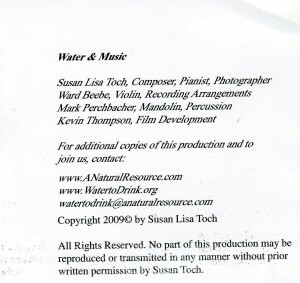 Musicians include an inter-disciplinary mix of Hydrology (composer and pianist), Geology (Violin and Arrangements) and Medical Technology (Mandolin and Percussion). Photographs demonstrate our water work around the world. Instruments donated by project communities include the Native American drum, gifted from the "Two Rivers Tribal Pow wow & Reconciliation" who worked together to heal the land and waters for all. Likened to our international low cost water project outreach, our impromptu live recording was accomplished with a simple MP3, in a two hour session with musicians who had never played together before. A unified demonstration of what can be produced when we combine our spirits in our common cause towards human and ecological health. Workshops and educational programs are also available. Thanks to all the contributors and to you for your support in this most heart warming unified effort working together in this global water initiative.